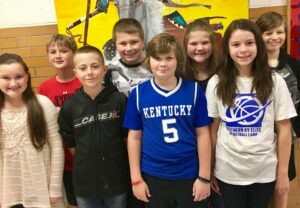 Adair County Middle School sixth grade students of the month are: Samantha Lawhorn, Lane Grant, Mason Caldwell, Braylon Breeze, Jetson Grant, Lilee Wall, Hannah West and Scottie Pyles. Samantha Lawhorn-Reading, Lane Grant-Science, Mason Caldwell-Science, Braylon Breeze-Social Studies, Jetson Grant-Social Studies, Lilee Wall-Reading, Hannah West-Math and Scottie Pyles-Math. These students work hard in their academics and are wonderful citizens of Adair County Middle School. We are proud of their efforts, hard work and positive attitudes.